Drivers make their way through blowing snow in Fort Fairfield Tuesday morning. PRESQUE ISLE, Maine — Whiteout conditions caused major driving hazards and road closures in Aroostook County Tuesday morning as well as an 11 vehicle crash on Route 1 in Cyr Plantation south of Van Buren where a police chief and plow truck driver were struck and injured. 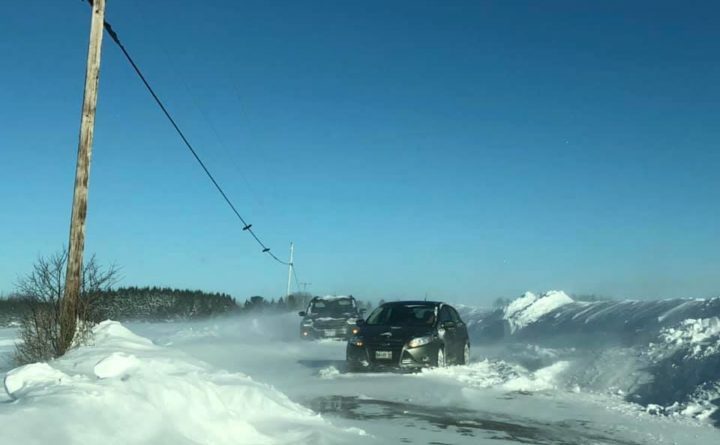 Winds of 20 miles an hour and more caused major visibility hazards around The County, including in Cyr Plantation where an accident involved 7 passenger vehicles, a pickup truck, two Maine Department of Transportation plow trucks, and a police cruiser, according to the Maine State Police. One vehicle struck Van Buren police chief Michael Bresett who had stepped out of his cruiser and was roadside after going to the scene to assist, police reported. Bresett suffered multiple broken bones and after being struck, dragged himself off the road to avoid being hit by an oncoming truck, according to state police. He underwent surgery at Cary Medical Center in Caribou and is now in stable condition, Van Buren police indicated on the department’s Facebook page late Tuesday afternoon. An unidentified MDOT plow truck operator also was struck and injured while on foot at the scene, according to the Maine State Police. Members of the Van Buren Ambulance Service transported that truck driver and others to the Caribou hospital to be treated Some were treated and released, while others were still receiving treatment as of 4 p.m. Tuesday, the state police said. The road was closed after the incident was reported shortly before 9:45 a.m. and then reopened around noon Tuesday. Officials also closed sections of Conant and Station roads in Easton Tuesday morning due to zero visibility, according to the Easton town office. The National Weather Service issued an alert for Aroostook County Tuesday morning, warning of blowing snow and whiteout conditions following a weekend snow storm that brought more than 1.5 feet of snow to much of northern Maine. Areas with open fields such as the section of Route 1 in Cyr Plantation are the most vulnerable to poor visibility. The weather service advised drivers to travel slow and with headlights on. In Fort Fairfield, the police responded to a pickup truck that rolled over on Route 1A due to snow drifts. The driver was not injured, according to Fort Fairfield Police Chief Shawn Newell. He added that the department also received calls about multiple vehicles stuck on the Dorsey Road. Meanwhile, a smaller but still potentially hazardous storm is in the forecast for Wednesday into Thursday, along with a brief rise in temperatures that could leave roads icy. A weather front with low pressure will bring snow to northern and eastern Maine starting around midday Wednesday, according to the weather service. A southerly wind will bring warmer air north and could lead to snow changing over to rain Down East Wednesday afternoon and then further north on Thursday, with high temperatures in Aroostook County of 23 degrees Wednesday and 33 degrees Thursday, according to the weather service. “Rain and snowmelt refreezing on the very cold ground will likely result in dangerous icy conditions during the second half of this week, especially on driveways, walkways and untreated roads,” the weather service said.